Brazil retains its No. 1 spot among Miami’s international overnight visitors – a pleasant surprise for local business leaders who feared recession at home would deter many Brazilians from flying abroad. Colombia has been Miami’s fastest-growing South American market, with 5% visitor growth in the first nine months of the year, while Germany and England topped European markets for growth at 6% and 5% respectively, according to the Greater Miami Convention & Visitors Bureau. Losing its No. 6 total visitors ranking to England was Venezuela, whose numbers dropped a dramatic 10% this year. The Venezuelan situation is unique in that political instability and a battered economy have led to a dramatic cut in flights, said Rolando Aedo, bureau senior VP of marketing and tourism. In preparation for what was expected to be a tough year in the face of a stronger dollar, the bureau kick-started a rigorous marketing campaign in Europe and South America over the past year. Although international passenger traffic at Miami International Airport as of Oct. 31 was up 5% from last year, in November the aviation director said passenger numbers from all countries in the Western Hemisphere were slightly down. The decline was apparent but not drastic, said Emilio T. González. 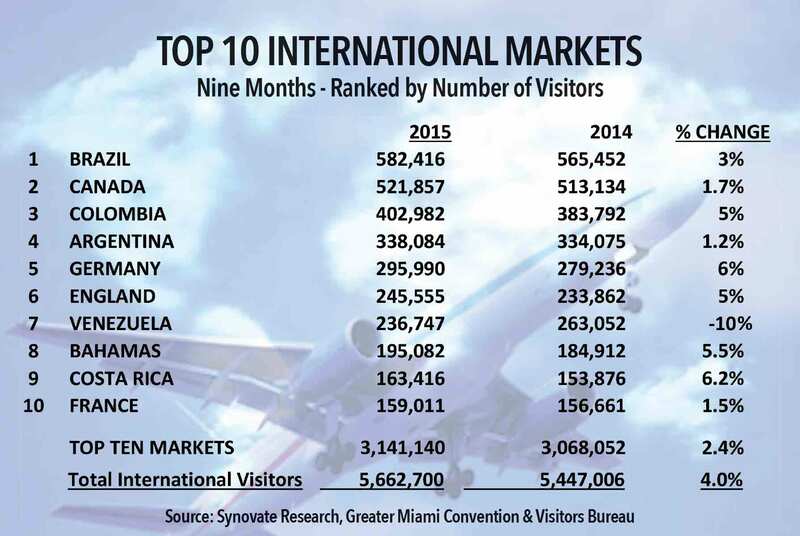 From the convention bureau’s perspective, its aggressive international marketing proved worthwhile: despite the sharp decline in Venezuelan travel, international visitors staying overnight in Miami from January to September totaled 5.66 million, up 4% from the same period last year. The top five markets for visitors – Brazil, Canada, Colombia, Argentina and Germany – are holding steady, with slight to moderate growth. The bureau places great emphasis on Brazil, which has historically been Miami’s most loyal market, displaying 8% to 15% annual growth in overnight visitors. But Brazil now faces a four-to-one currency ratio against the US dollar. Nonetheless, nine-month overnight Brazilian visitors rose 3% to 582,416. Miami’s tourism industry has been breaking records in multiple categories within the past year, with steep hikes in visitor numbers, industry jobs and economic activity. Among other peaking numbers are the most recent tax collections. October revenues streaming from the tourist development tax were up 18% while food and beverage tax collections from hotels were up 15% from the same period last year. Convention development tax collections rose 12%.